Mull’s interior is often, and perhaps understandably so, forgotten. 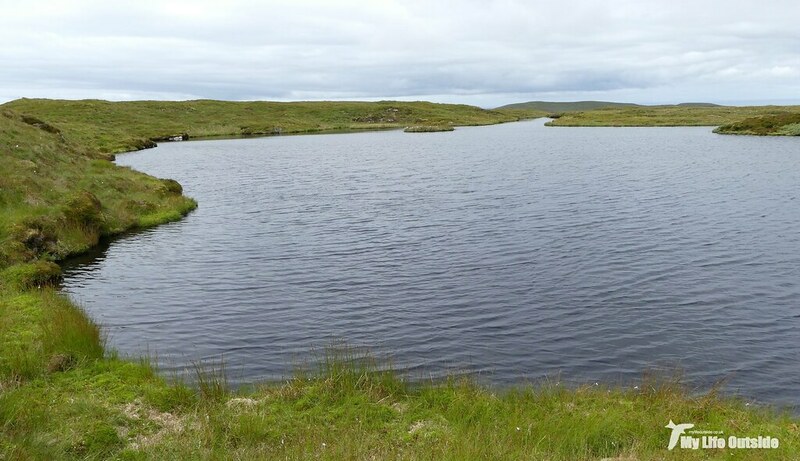 A mix of ankle twisting tussocks, choking bracken and foot eating bogs it’s probably not high on everyone’s list of destinations, particularly when the island’s coast has so much to offer with considerably less effort required. Not all that’s good is easy however and here we have a case in point. If you’re prepared to tolerate the odd damp foot, cover distance a little slower and prepare appropriately then there’s some excellent walking to be had. 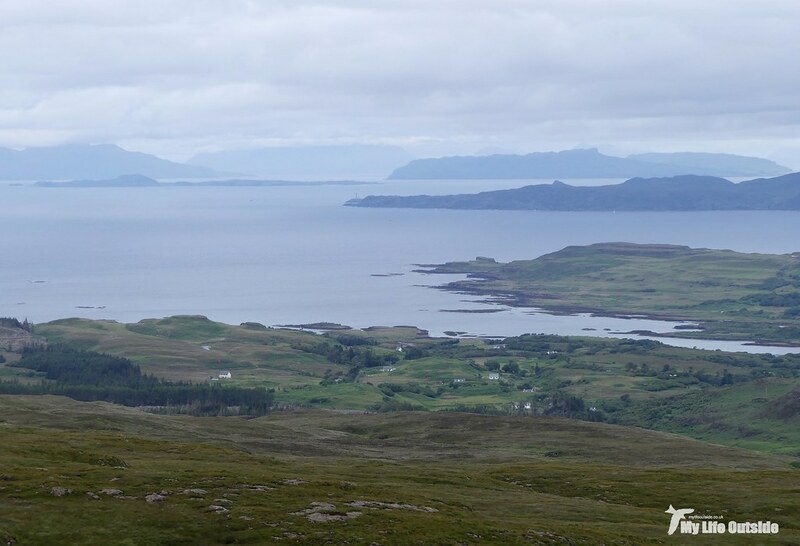 There are no paths, plenty of wildlife and, if the weather holds, outstanding views for miles in all directions. Combine that with the knowledge that you’ll probably be the first person to tread that way or stand on a summit in what? Days, weeks, months even? And you’ll quickly come to realise why the extra effort is all worthwhile. On Friday we decided that it was high time we took some of our own advice and headed for the hills. And of these there is no shortage on Mull with perhaps its most famous being Ben More, Scotland’s only island Munro. We’ve conquered its slops twice before and may do so again in the future but with the weather forecast looking decidedly dodgy we decided that something a little lower might be more sensible. Poring over our OS maps there were certainly plenty of candidates but our eyes were drawn to Beinn an Lochain, so called for reasons which will soon become abundantly clear. Setting off from the main road (single track lane) we passed through a deer fence and into an area optimistically marked on the maps as woodland. Now I’m no expert but scanning around I’d have expected to see trees, even one would have been nice, but very quickly drew a blank. In defence of Ordnance Survey there was indeed a woodland planned for here but like so many Millennium based projects it hasn’t quite delivered. Yes trees were planted in their hundreds but I couldn’t help feeling at the time that expecting small saplings to suddenly flourish in this boggy ground might be asking just a little too much. And so it has proved to be. In fact the only real achievement so far has been to provide the Red Deer with a handy nursery for their young, despite the aforementioned fence designed to keep them out, as well as making the area a complete hazard to walk across. You see planting involved using a digger to scoop out a single buckets worth of dirt into which the sapling would be planted. This left behind numerous deep holes, irregularly placed, which have since filled with water and grassed over just waiting to catch the wary off guard. You need your wits about you to make it through here unscathed but we managed it and were soon out into more open countryside where the hazards were at least natural. As a few brief showers powered through it was clear that we weren’t going to be treated to much in the way of sunshine but there were still a few Dark-green Fritillaries on the wing as well as Small and Large Heath, all the while the views behind us beginning to open up. 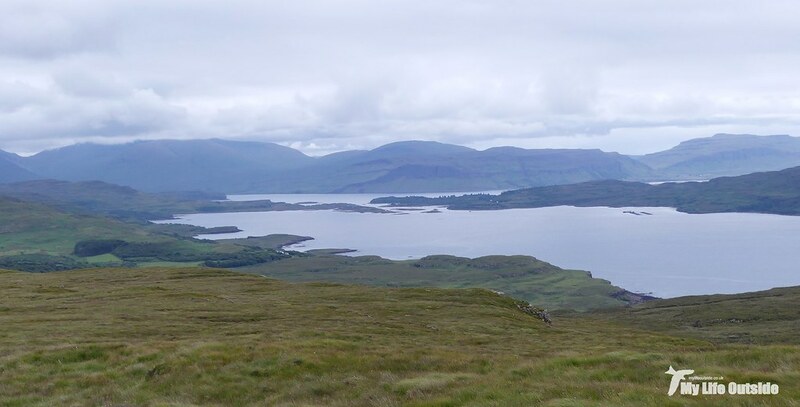 Every stride took us higher, crossing off the contours via distinct steps in the landscape revealing layers of larva and ash lain down during Mull’s formative years. 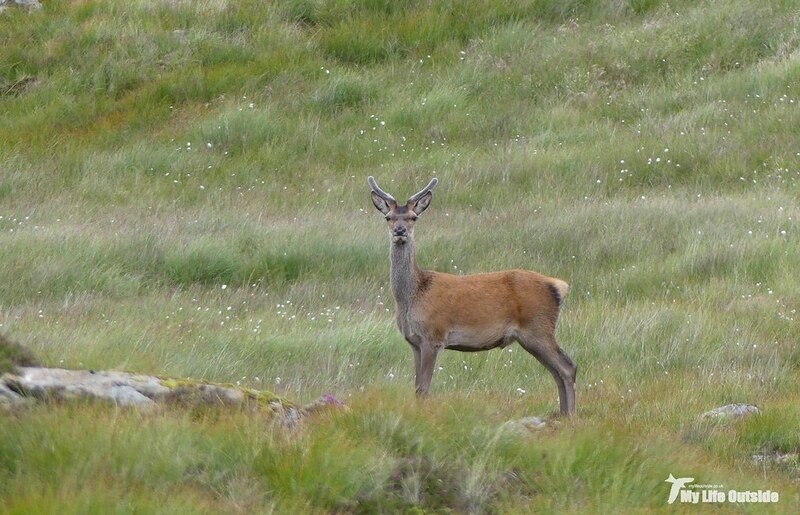 Along the way we’d occasionally startle a Hare or small herds of Red Deer, a mixture of females, juveniles and stags sporting velvety new growth antlers. Often they’d hear us long before we spotted them but every now and again we were able to gain the upper hand and sneak in, undetected. There were birds here too. Meadow pipits and Skylarks being by far the commonest but also Ravens and even a passing Golden Eagle. Judging from its plumage I’d have said a younger bird, perhaps two or three years old, soaring a couple of levels above us just a few meters off the deck. It wasn’t long before we were up there too, looking over the waters from which Beinn an Lochain gets its name. As far as summits go Beinn an Locahin’s is surprisingly indistinct. Normally I like my mountains to deliver a large cairn or even better a trig point, hell I’ll settle for just being able to tell where exactly the highest point is. 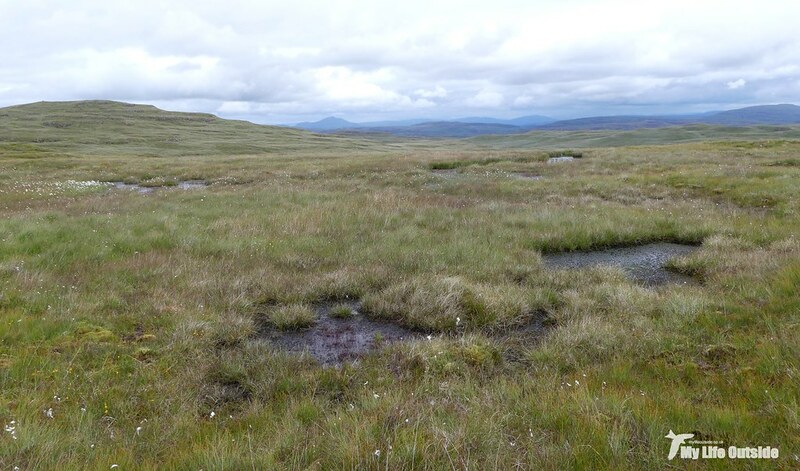 Not here though where a wide plateau of eroded peat and bog is all you’re going to get. Standing off in the distance however was something more like it. 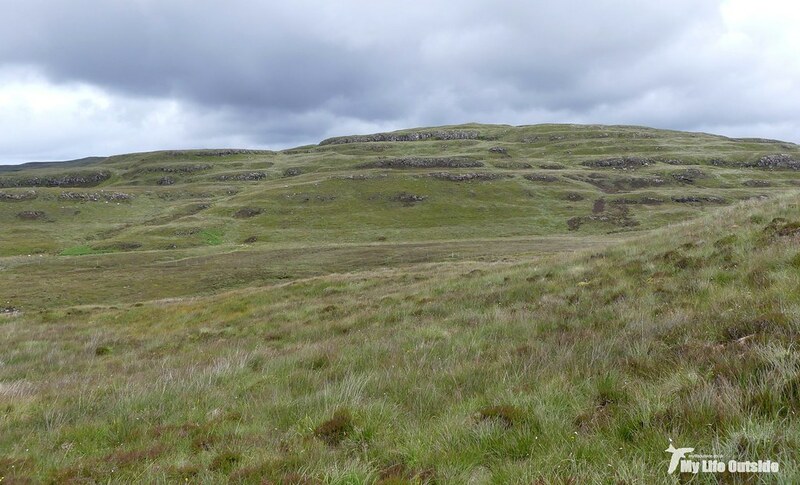 At barely fifty meters higher Carn Mor took longer than you might expect to climb thanks in no small part to the intervening descent and, you’ve guessed it, bog which had to be crossed first. 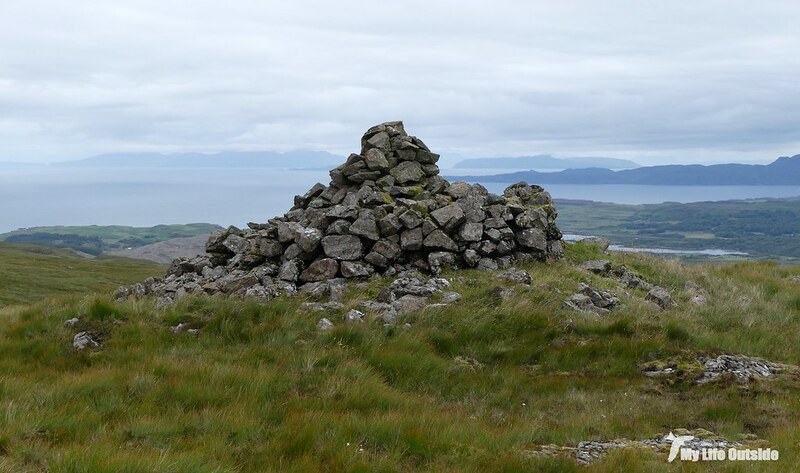 Once there though we were greeted by a cairn of impressive size and structure given its remote location and views which more than kept up their side of the bargain. The only trouble was that we seemed to have lost some of the islands which we’d previously been able to see. Had Tiree been gobbled by rising sea levels perhaps? I’m sure its residents would be glad to hear this wasn’t so. What it did signal however was that the weather was starting to close in and with it we decided that an attempt on our third summit of the day would prove foolhardy, so instead started our return. The rain quickly became torrential and our plans to find a new route home through uncharted territory quickly started to look like a bad idea. The culprit? That damnable phantom forest which instead of cutting through at its shortest point we were now crossing lengthwise. I quickly lost count of the number of holes we stumbled over or simply sank right into but with a couple of miles still to go there really was no alternative other than a very lengthy diversion. Of course that meant going back through the horrors that we’d already completed which I’ll admit held little appetite. The only thing for it was to soldier on but I can safely say that those were some of the hardest miles I’ve walked all year. The sense of relief at finally spotting the road was palpable but our struggles hadn’t been entirely in vain. Along the way we’d spotted three Slow-worms and a pair of Grey Wagtails clearly defending territory, not to mention another pair of Golden Eagles. Of course looking back now it’s the climb up Beinn an Lochain and Carn Mor which I remember most fondly but I’ll be making sure we avoid this particular plantation in future.